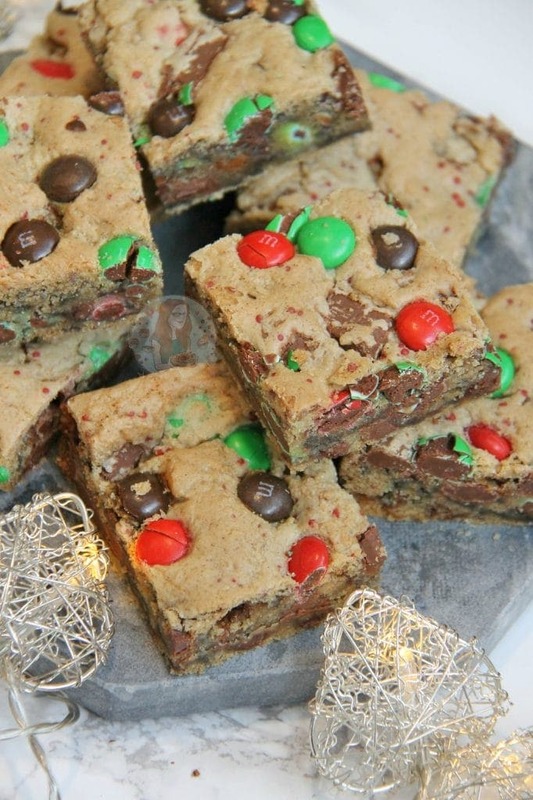 Christmas Chocolatey and Cinnamon Delicious Christmas Cookie Bars! 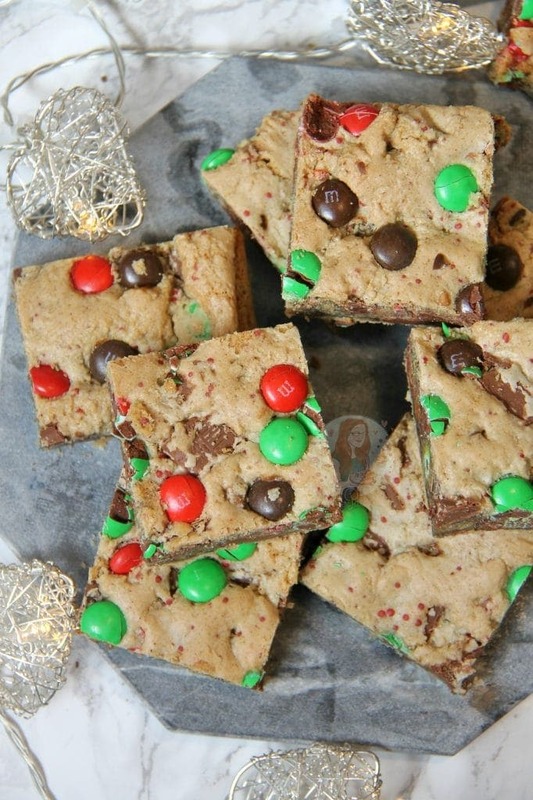 So, I won’t lie.. this is a DELICIOUS Cookie Bar recipe, that I am just going to go ahead and call it Christmas themed. 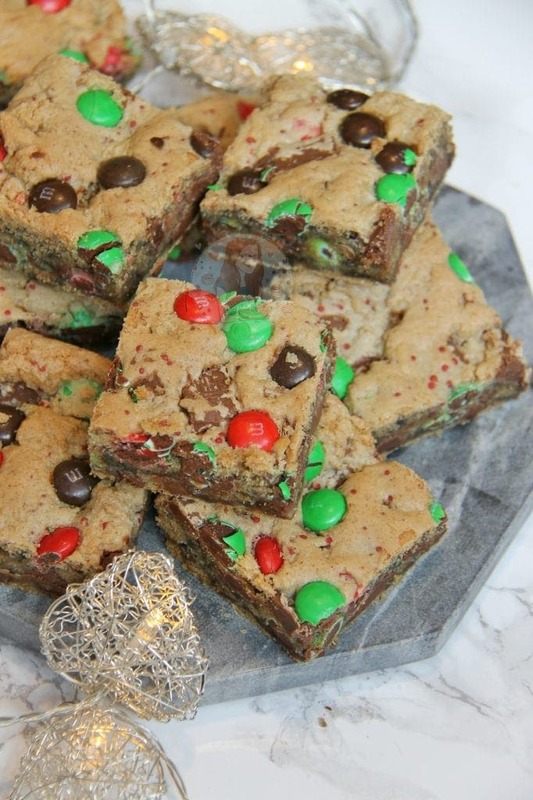 There aren’t that many alterations from my other cookie bar recipes like my Oreo Cookie Bars and my Mini Egg Cookie Bars if I am completely honest. However, the addition of Cinnamon into these delicious beauties, along with some themed colours of Red & Green, I think they’re suitably Christmas themed. The Red & Green colours make anything Christmas themed for me, and I just love it. The colours remind me of Holly leaves and berries like on the top of my Christmas Pudding Chocolate Truffles, and I just think its adorable. As I made these a little while ago before this post has gone live, I picked through some packets of M&Ms to get the Colours out, and then used the Brown ones as well as they’re just Chocolate coloured. This might be faffy, but if you’re going for a theme like me then its worth it! You can adapt this recipe so easily to be Ginger flavoured instead of Cinnamon, or even nutmeg flavoured. If you want to make it into a a Chocolate type Cookie Bar, you simple need to use 200g of Plain Flour, and 50g of Cocoa powder in place of the 275g of Plain flour in this recipe. Luckily, everything else will stay the same. For a recipe without Cocoa Powder like this one, I find you always need a tad more ‘dry ingredients’ as cocoa powder is naturally quite drying, so in this you use 25g more plain flour then the total dry ingredients in the chocolate version. Whisk/Mix the Plain Flour, Bicarbonate, Salt, Cornflour and Cinnamon together so its evenly distributed – leave to the side. 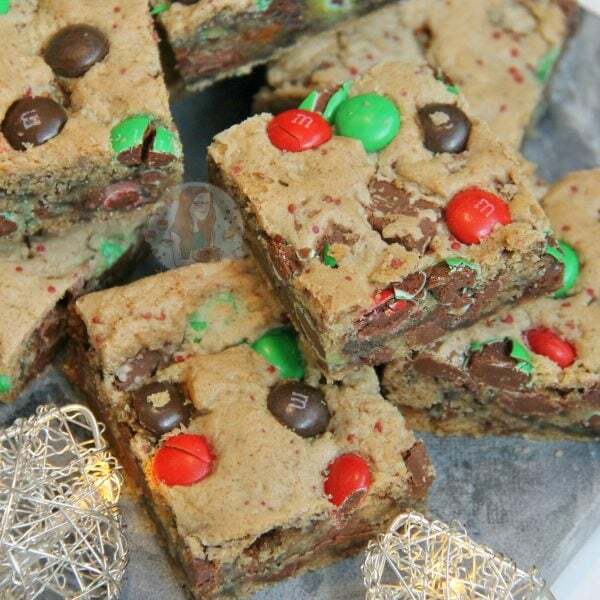 Add in the Dry Ingredients, all but a handful of the Christmas Coloured M&Ms, and the Chocolate Chips and mix with a spatula till a thick cookie dough is formed. 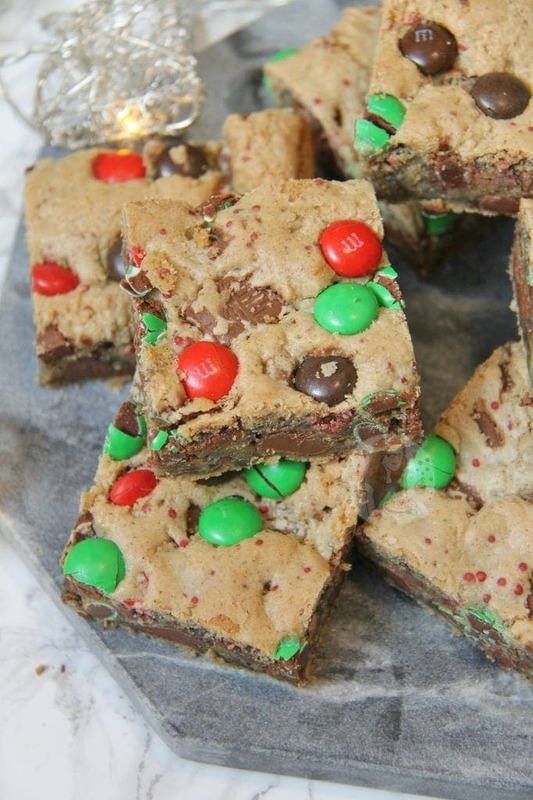 Press the mixture into the bottom of the tin and press in the handful of Christmas M&Ms into the top for decoration. 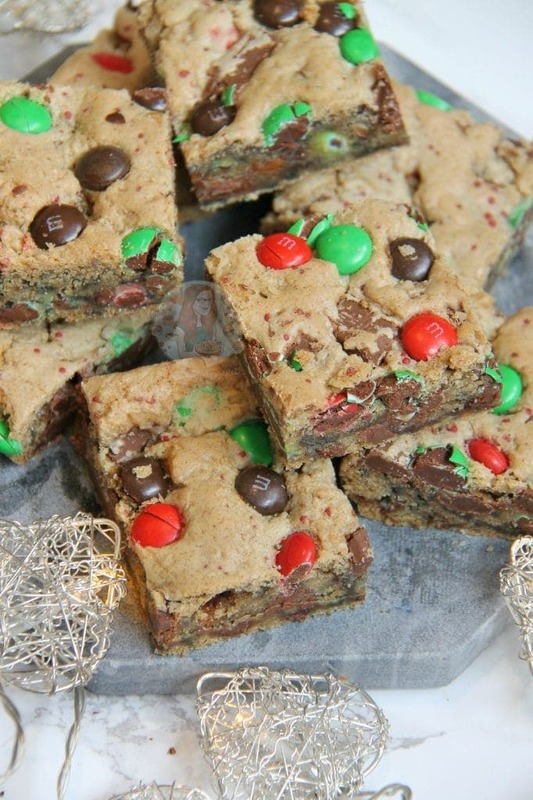 Bake the traybake in the oven for 20-25 minutes, until the top of the cookie bake looks ‘dry’! You can of course use any other chocolatey treat you like in them, or even the dedicated Christmas M&M packets, or even the Crispy or Peanut M&Ms! 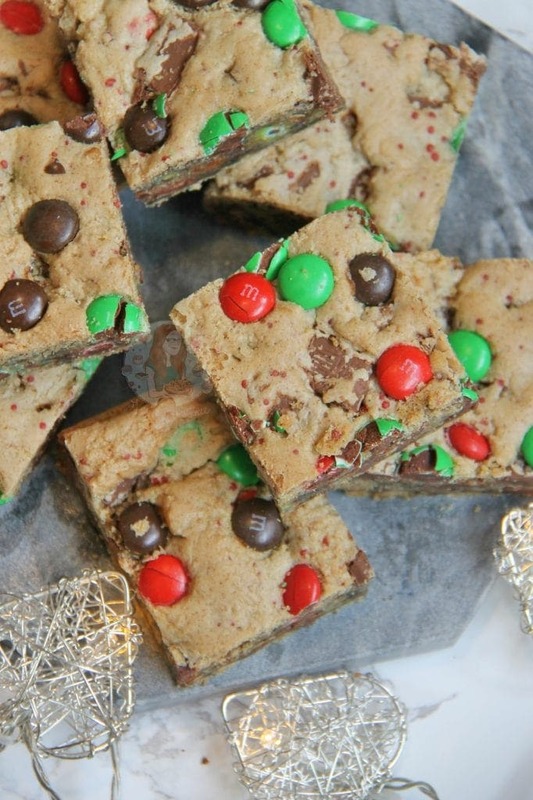 Find my other Christmas & Cookie Recipes on my Recipes Page! Older Next post: Baileys Cake! Newer Previous post: Chatting about Anxiety.